While passing through beautiful Kanab, Utah, on my way to hike Wire Pass, Buckskin Gulch and the North Coyote Buttes, I spotted a cop on the side of the road, presumably speed-gunning people as they entered town. Last time I blew through Kanab I noticed it was crawling with cops, or rather, with speed traps: cops parked on the side of the road just out of sight until you were too close to slow down in time. This time I slowed down figuring if this guy was lurking there must be other cops around too. As I passed by Officer Man in his poh-leece cruiser, I noticed he had a strange complexion, sort of green and sick looking, and he had a weird pencil neck. I slowed down to shoot him a little Whachoo looking at, badge buddy? glare. He had his windows rolled up but, since his engine was off, he had no A/C so it must have been 300 freaking degrees inside his car, and yet this guy is not even sweating. 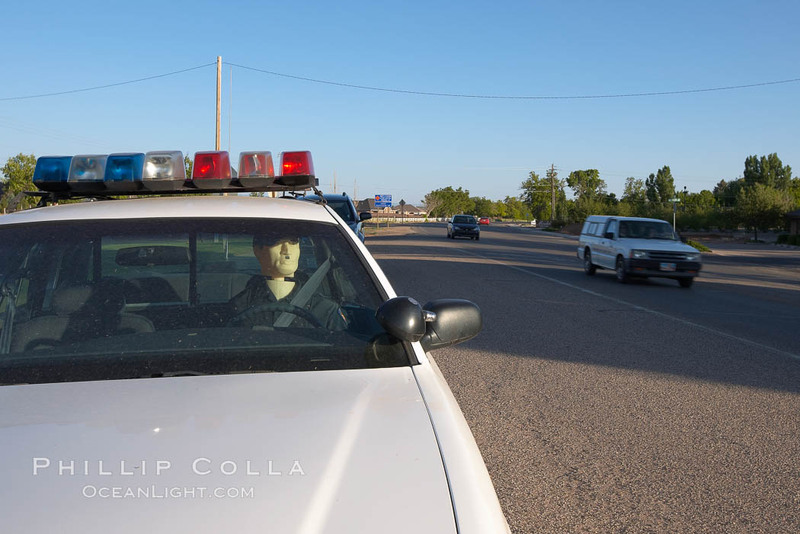 Eventually my road-weary pea-brain figured it out: the cop was inflatable, a mannikin, a dummy. 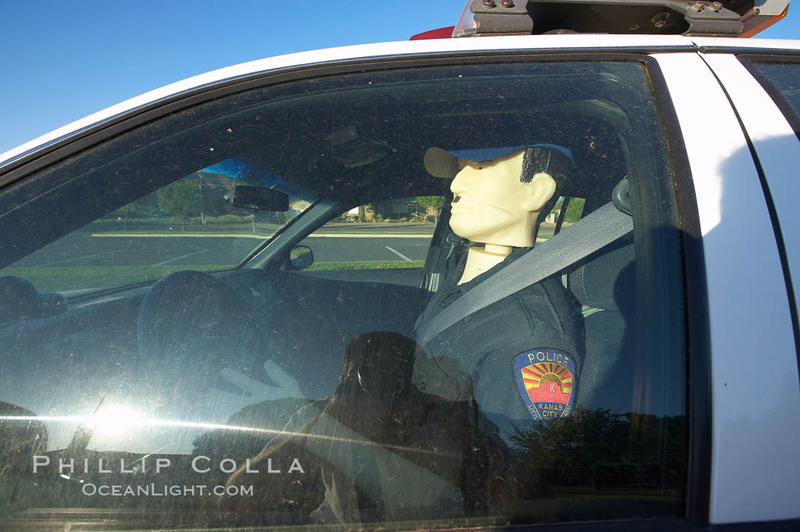 I guess the real cop on duty — one of Kanab’s Finest — was off somewhere taking a little afternoon siesta with his honey and propped up this doppleganger as a placeholder until he got back. I just had to stop and introduce myself, never having had a chance to say “Officer, I suggest you use your night stick” to an inflatable adult novelty doll sporting a police costume and KMart shades before. He let me take his photo but wouldn’t comment on whether he got his training at the academy or came straight from the factory. Check out his bizarre little Hitler mustache, what’s up with that? Inflatable cop. Kanab’s Finest, hard at work. A Kanab police officer actively enforcing the speed limit in the town of Kanab, Utah. Of course the blow-up cop did what he was supposed to — I slowed down. I’m guessing Kanab probably has the most cost-effective police force in the nation. P.S. A Kanab resident who spotted my little blog posting kindly emailed me to say that Officer Man’s real name is Latex Larry. A search on the internet reveals that Latex Larry has worked assignments in Fredonia as well. Seems the guy works 24/7 and all over the place.